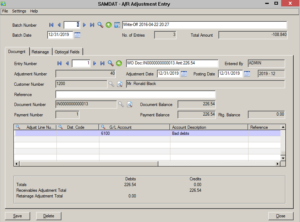 Sage 300 allows a user to apply a payment to invoices for more than the amount of the payment. 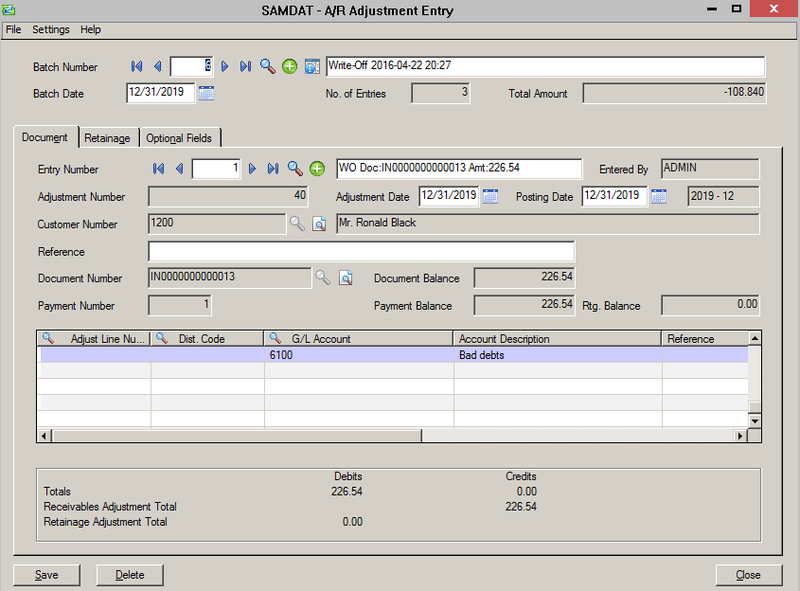 A payment that is not fully applied, displays as a negative value on the A/R Aged Trial Balance. A payment that is over applied, displays as a positive value. Typically, this would not be an issue, however, the apply feature for credits and the entry of credit memos can only be used against invoices, and not against the over applied payments. If the over applied payment is from a check receipt, the check can be reversed in Common Services – Bank Transactions – Reverse Transactions, but if the payment was received via credit card, through Sage Payment Solutions, that transaction cannot be reversed. If the customers balance is correct, no action needs to be taken. When the next payment is received, it may be applied to that over payment record. Only new payments can be applied against the over payment, and it can only be completed at the time payment is received. If the balance is incorrect, a credit memo should be created, but it cannot be applied against the over applied payment. The customer balance will be correct, but the aged receivables will show a credit balance and an equal over applied payment balance. In order to clean up your records, a zero dollar receipt can be entered and applied to both the over applied payment and the credit memo. 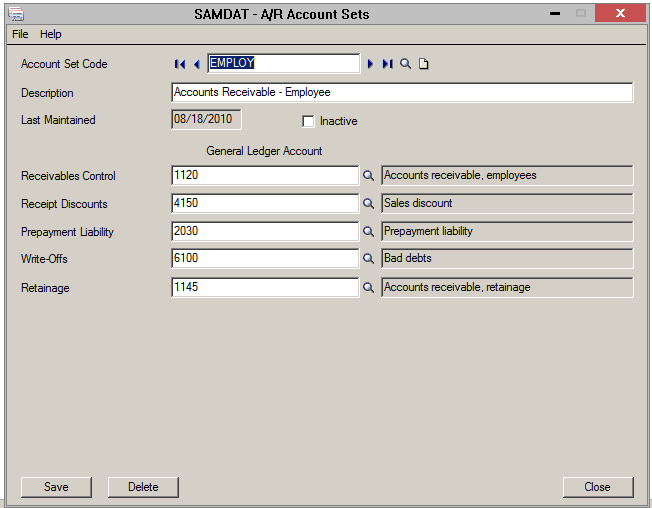 This will remove both transactions from the A/R Aged Trial Balance. If you have this problem, please feel free to contact me at Michael.Ericksen@wacptrs.com. Sage Alerts & Workflow is a Sage add-on product that allows users to generate queries depending on the information that is being tracked. For example, if a user wanted a list of open invoices from clients that are over 30 days due and wants the list generated once every 15 days, Sage Alerts can generate the list and send it to one or multiple departments via email automatically. Users can also customize the categories that they wish to include in the query. For example, they can include the name or ID code of the sale representative of a specific transaction, the payment code method that was used for the transaction, and which pricelist was used, just to name a few. Currently I am working with a client who uses Sage Alerts. One of the queries that they use includes all inventory items whose quantity on hand minus the quantity on any current sales order is less than or equal to 0. Another query, which is scheduled to run every Monday at 8AM, is to gather a list of clients who have open invoices that are over 30 days old. For this same client, I am currently trying to create a query that will compare sales from this current year to prior year based on a specified date range. Then the query will identify those customers whose incoming sales revenue compared to the prior year is less than $3,500.00. Sage Alerts & Workflow is also compatible with Customer Relationship Management (CRM), Human Resource Management Systems (HRMS), Enterprise Resource Planning (ERP) software, to name a few. For more questions regarding the acceptance of credit cards through your Sage ERP software, contact your WAC Solution Partner for more information. Written by Stephanie Piller, WAC Solution Partners- Midwest. Why Sage Payment Solutions for Credit Card Processing? Sage Payment Solutions is a payment solution software that allows users to accept payment transactions. It includes an online portal for users to easily access when out of the office and allows users to keep track of their statements and transaction activity. Currently I use Sage Payment Solutions with Sage 300 ERP 2017 accounting system. In Sage 300, once I enter an invoice for the customer, I can click “charge” directly from the invoice entry screen and the Sage Payment Solutions window will pop up, allowing me to complete the credit card transaction instantly. The payment transaction is quick and simple. Sage 300 specifically can save more than 20 credit card accounts per customer. Sage Payment Solutions allows users to accept payments from their desktop, laptop, smartphone, and tablet for quick transactions at the point of sale at or away from the main business location. This system accepts Visa®, MasterCard®, American Express®, Discover®, Diners Club®, JCB, Debit/ATM, and private label cards as well. The payment hits our bank in approximately two business days. There are many different processing companies out there. What makes Sage Payment Solutions a better option for Sage ERP customers? Quick, easy, one system integration. Not only do you have access at your fingertips all within one system to process, but you have one Vendor to deal with giving you leverage on your rates. http://www.wacsolutionpartners.com/wp-content/uploads/2013/07/wacsp.png 0 0 Kari-Ann http://www.wacsolutionpartners.com/wp-content/uploads/2013/07/wacsp.png Kari-Ann2017-01-05 16:19:132017-01-05 16:19:13Why Sage Payment Solutions for Credit Card Processing? In all my years of working with financial information I have found two ways to hide information (something a business with integrity would never want to do). The first is illegal which is to not actually report the information. The second is legal and is to bury it with detail. When there is too much data to review or the data is not summarized so it is easy to process, important information can be missed. When I design income statements for my clients, I attempt to group all of the expenses into five to seven categories. It does not matter if the company has fifty accounts in their chart of accounts or five hundred or more. By carefully grouping expenses into meaningful categories we can quickly review the income statement to find areas that require additional research. Sage Intelligence Reporting and Microsoft Excel work very well for designing financial statements. Sage Intelligence helps a user create an income statement that has just a few categories, but at the same time allows for any or all categories to be expanded to show all the accounts contained in that category. As recently as last month, my client, who is running Sage 300 2014 and I were able to find significant issues that needed to be immediately addressed. In just a couple of minutes we were able to find the issue by starting with the summary view of the report and expanding it to see the detail. By effectively designing the report, it was an efficient use of time to begin with the summary view and “work backwards” to easily find the problem. Companies sometimes have customer entries in Accounts Receivable that need to be cleared from the ledger because they are non-recoverable. This includes transactions such as bad debts, debt forgiveness (e.g. interest charges) and small over/under payments. Often the transactions sit on the ledger for a while because it is troublesome to correct them. 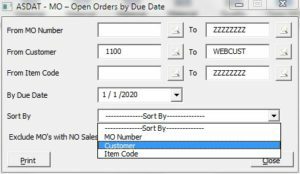 In Sage 300, there are a couple of processes that can be used to clear these items. In situations where there are multiple entries to clear at one time, and where a set of criteria can be defined for doing that, the write-off function may be the answer. First, review the Accounts Receivable account sets to make sure the Write-Offs General Ledger account is the correct one for each. Write-Offs is the expense account to which amounts are debited when you write off transactions and balances; it is often called ‘bad debt’. The Create Write off Batch screen automatically produces transactions for this account. Mr. Black’s account has three transactions that will be part of the write-off: a payment and two invoices. 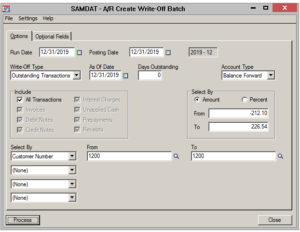 Go to Accounts Receivable Periodic Processing and choose “Create Write-Off Batch”. Complete the screen selections as required to gather the appropriate transactions. The choice for the “type of transaction” to write off include outstanding transactions, overdue transactions, overdue balances, outstanding balances and outstanding retainage. In this example, “outstanding transactions” is chosen. Choose the Account Type; Ronald Black’s account is Balance Forward, so that is selected. Choose the document types to include in the process; at least one must be selected. In this example, “all” is chosen, though it could have been limited just the types of transactions outstanding. Choose either “amount” or “percentage” as the “Select By”, and enter non-zero values in the “From” and “To” fields. When creating a batch to write off small balances, enter a range where the values represent the limits the company wishes to write off. In this example, to include the outstanding cash, which shows as a negative number, the “From” is set to that value, and the “To” to the value of the highest invoice value for the customer. (Note: it is not necessary to use the exact amounts for the range, only that they be set to allow the desired range of documents to be captured). In the bottom portion of the screen, choose up to 4 different criteria to select the customers who will be included. Leave all as (None) to gather data for all customers who meet the other criteria, or enter the appropriate range. 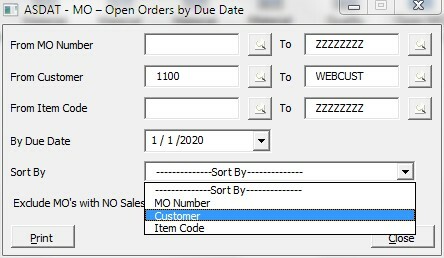 Selections may be done by a number of customer-related variables – use the drop downs to review and choose the criteria required. In this example, only Customer Number 1200 (for Ronald Black) is chosen. Note that there is an “optional fields” tab. This may be used to further scope the transactions that will be included in the Write-Off batch. This example does not use optional fields so none are selected. Once all criteria are set, select “Process”. 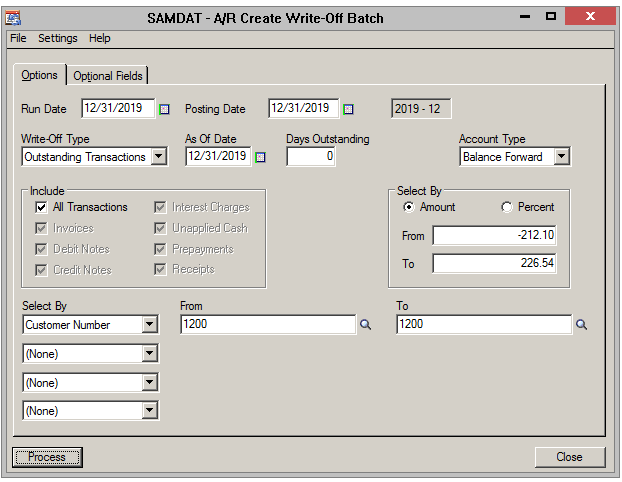 A batch of transactions meeting the criteria is created and posted as an open batch with a description of “Write Off” in the Accounts Receivable Adjustments batch list. Each transaction being written off is a separate entry in the adjustment batch. The batch may be reviewed and transactions edited as needed, and then posted as a normal adjustment batch. If the batch is incorrect, it can be deleted and the process started over. Reports are one of the most important tools that everyone in a well-oiled organization needs to accomplish their goals. From the top of the organizational chain down to front line managers, reports are the life blood. When it’s difficult to summon the exact information you require, heads explode and the life blood starts hemorrhaging. A little over dramatic but point is, it shouldn’t have to be that way. Canned reports that are provided by that new ERP application can be insufficient and ineffective. You require custom reports that offer the precise information in the correct sort order and so forth. You have reached Information Nirvana. The problem with creating custom reports in many ERP systems are that they give you the tools such as SAP Crystal Reports but no real good solution to easily enter all those important parameters. If you rely on Crystal Reports internal parameter screen, it’s kludgy at the very least and ugly at best. If you’re providing your client with the panacea of reports, you are letting them in on a huge let down when they have to enter the necessary parameters. 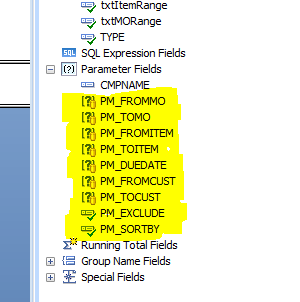 In a recent Sage 300 project, I came across an incredibly elegant solution to my parameter screen problem. 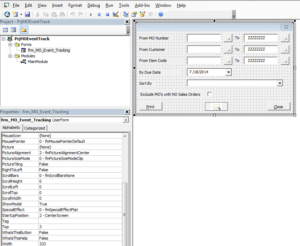 A fellow consultant provided me with some valuable information using Visual Basic Macro (.AVB) files to provide a customized parameter screen for Sage 300 projects. Although I’m not an expert in Sage 300, this quite literally has the potential to open a lot of custom report doors and I will share what I learned with you. If you have some knowledge of Visual Basic for Applications (VBA) then you will have no problem utilizing Visual Basic Macro’s for your Sage 300 report projects. I will refrain from providing a history lesson on the programming language and its intricacies. Let’s get started! An .AVB file. This is essentially a Visual Basic program. It has the graphical screen and source code embedded in the file. If you have ever built a program using Visual Basic 6 or VBA in Microsoft Access; same thing. An entry in the XXrpt.ini file. This file is located in the program modules folder. In our case, we will be using the Manufacturing Module that was developed by AutoSimply. The module folder starts with an “MF” so you will find this in the MF62A folder in our case. The entry will be added to the end of the ini file. 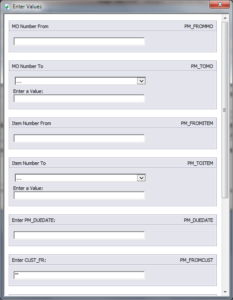 The entry consists of report information such as the crystal report name, paper size, number of output parameters, and what those parameter names are. The image below is an example of our setting values. And finally, the crystal report. Our report uses an ODBC driver for the data source. 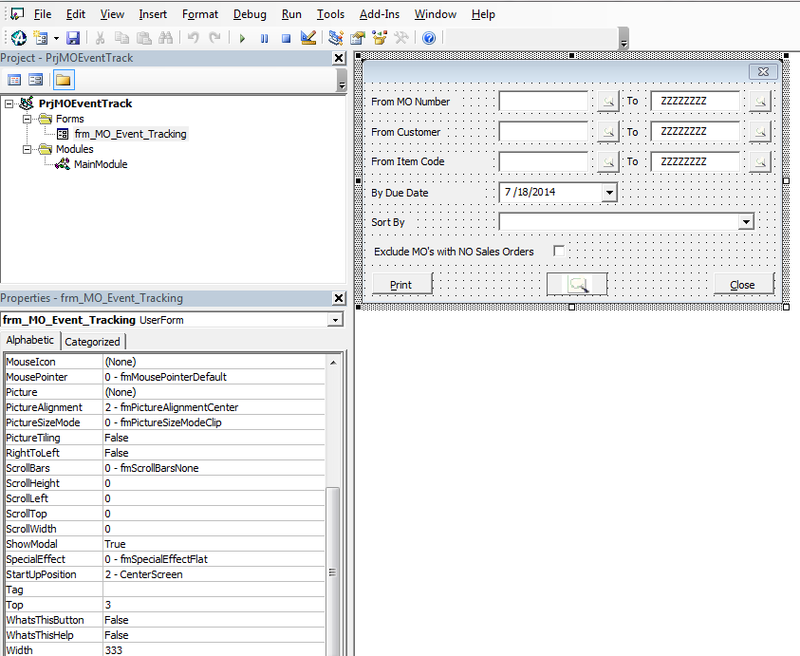 It points to our Sage 300 data located in Microsoft SQL Server. I won’t go into the details of setting up the database configuration or report development, since that is a topic deep in mystique and beyond the subject matter in this article. 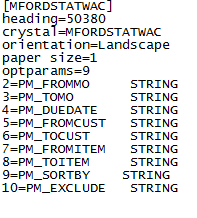 What you need to have in this report are parameters precisely named as the ones in the ini file example above. More on this later. 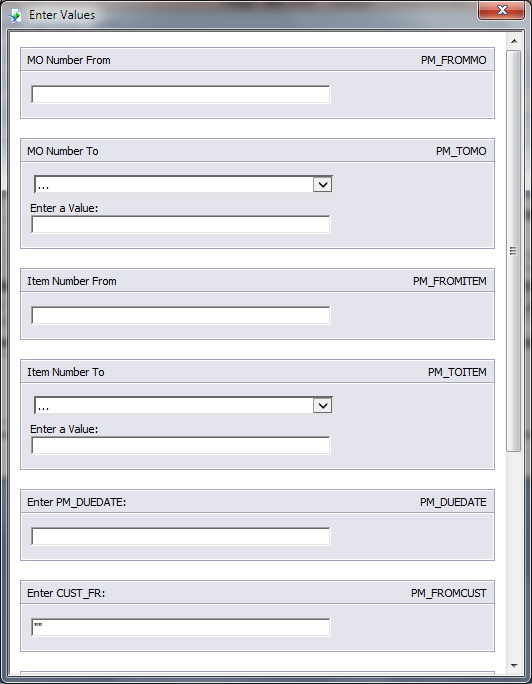 What comes first, the report or the parameter screen? The obvious answer in my mind is the report. This, of course, is the most difficult task you might think, and you would be right. After you have developed a parameter screen, this becomes a reusable component in your future report projects in Sage 300 and your main focus and work will be towards making that awesome report for your boss or client. As mentioned earlier, I won’t go into the minutia of writing a crystal report but there are a couple of important elements that you will need to include to make this successful. The SortBy group is a grouping that allow the report to be sorted by any field in the report that you deem necessary. The sortby group will be passed the value to sort by in a formula that will retrieve the parameter from our parameter screen. It is important to offer your client this option since hard coding sort fields are not dynamic and limit the effectiveness of the report. In our example, we will sort by three different fields, all mutually exclusive. This is the most important element to our report. This is the whole reason we’re building a parameter screen in the first place, right? 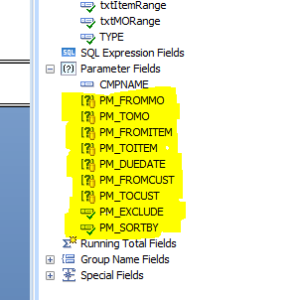 Below is an example of where those parameters are located in the crystal reports designer. Pretty long and confusing if you’re not fluent in the T-SQL language. With your report completed, we will continue on to the .AVB file. As stated earlier, if you have experience writing Visual Basic code in any of the Microsoft Office suite of products, then you will know how to write code in Visual Basic Macros. Since this is a high level article, I will not give a line by line rundown of the code but a list of programming rudiments. Your Main Module will include API definitions for Sage 300 and some MS Windows functions. References to the Accpac Manager and MS Windows dll’s. A main sub routine to start the program with your initializations. Event code that will fire when any of those parameter fields or buttons are acted upon. Error captures. This is needed to handle error exceptions in an elegant way with some form of exception description for debugging. With the ability to create these custom parameter screens, you have a set of powerful development tools at your fingertips. There is no need for SDK’s that are costly and have heavy learning curves. For those with some programming ability, this capability with bring immediate dividends to your organization. If you were given the choice between figure 4 and figure 5, which one would you choose? I think figure 5 is the obvious choice.